jacob's bladder: location, location, location! If the Incas knew one thing, and it seems like they knew a great deal, they knew the fundamentals of real-estate. The Sacred Valley of the Incas must be one of the most amazingly breathtaking places on earth, and its not just the altitude. The 19th century historian of the Incas, Sir Clements Markham wrote that "the wide world might be searched without finding a rival, in enchanting beauty, to the Sacred Valley of the Incas" and he could be right...in any case its a search I'd willingly take up if anyone is hiring for that sort of thing. After an extensive searched, I came across what could be the only road bike in southern Peru: a foxy old red Bianchi track bike...that was a tad small for me. So, after 2 days in the saddle alternately racing and crawling through the Sacred Valley, my shoulders are a bit on the sore side. 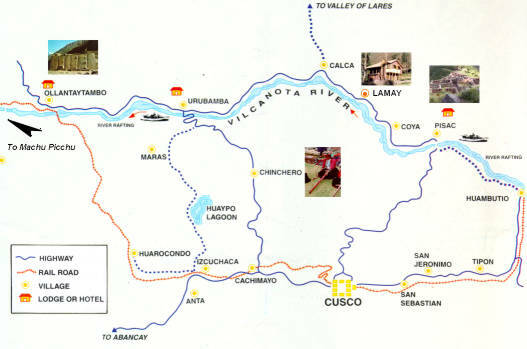 From Cusco, its about 13km uphill to Tambomachay, an Incan ruin on the ridge of the hills that form the Valley of Cusco. 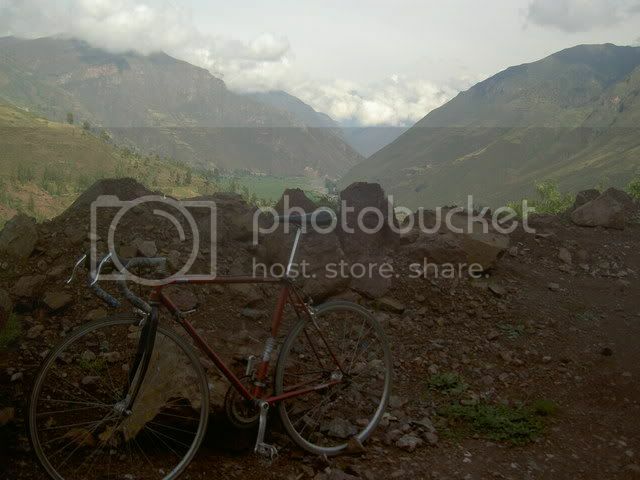 Once I got to the ridge, I didnt have to peddle again for 18km all the way down to Pisaq. The descent from Tambomachay to Pisaq has to be the most beautiful, surprising, and terrifying ride I've ever done. 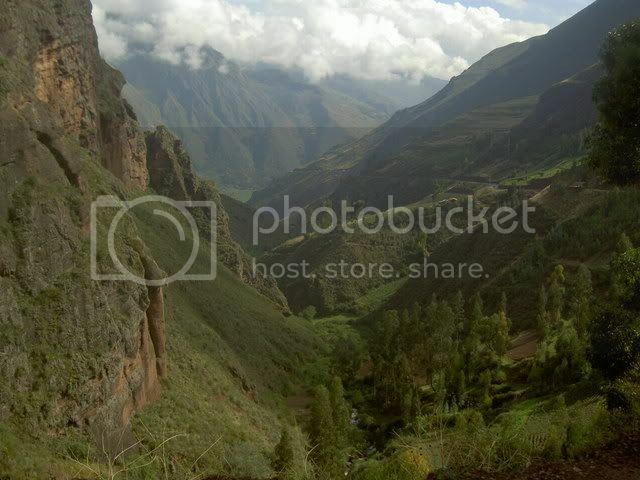 The temptation to look at the view was tempered by the hairpin turns and the potholes, not all that many, but big enough to contain their own Inca ruins. At everyturn a new set of hills showed themselves, and at each of 3 towns I thought this must be it, time to peddle again, but the hill kept going and going. Once I got to Pisaq I stopped to look around the small market in the town square and get some breakfast: bananas and water. 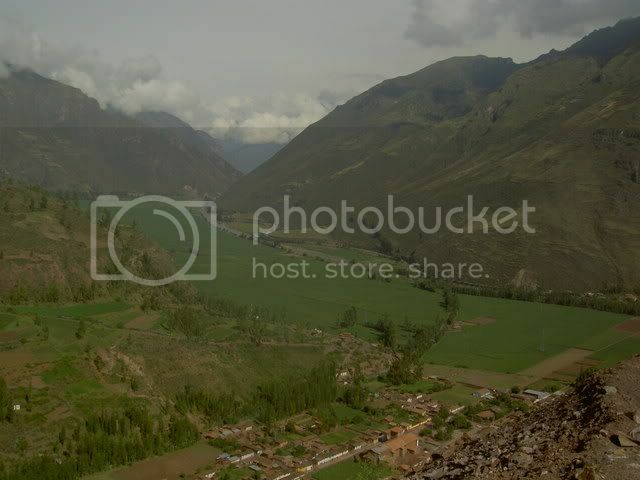 From Pisaq, I followed the floor of the valley alongside the Vilcanota River. 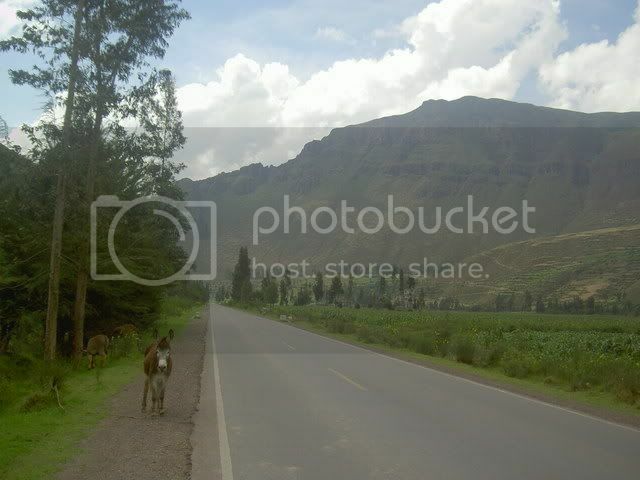 A slow and steady descent to the town of Urubamba. On my right, green hills rose up and then turned steep, leading up to rocky peaks, behind them, in the breaks in the clouds I could occaisonally see the snow capped mountains of the ridge behind, that form the walls of the Valley de Lares. On my left, fields, the river, more fields, and then sheer cliffs up to the plateau between the peaks on that side and the valley below. Behind and in front of me, the road, used to herd sheep, llamas, pigs and donkeys from pasture to pasture, leading eventually to Machu Picchu. 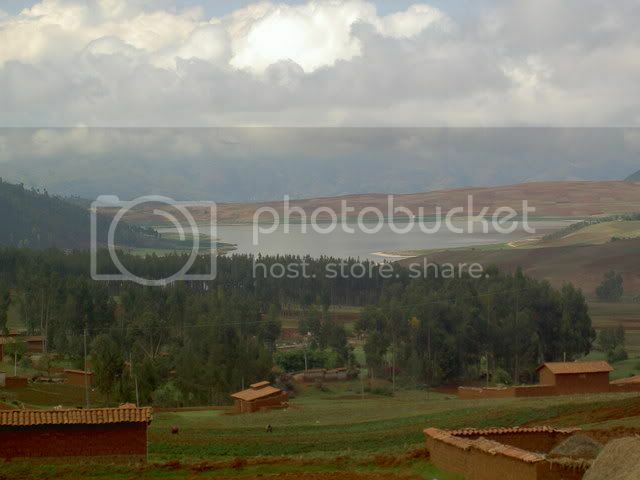 I caught a bus up the left hand side of the valley from Urubamba to Chinchero, where I spent the night. Chincero is named after a palace built there as a retirement home by one of the first Incas...beats Florida for damn sure. 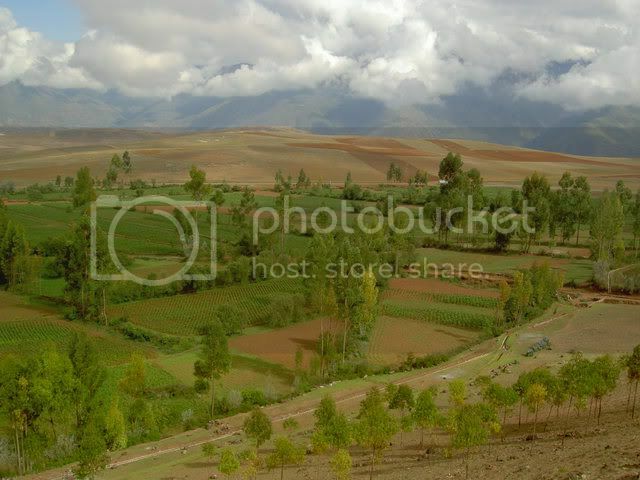 The next day, I headed back down towards Urubamba, enjoying the rolling hills of the high plateau. Before I got to the steep windy descent to the valley floor I veered of the left to the towns of Maras and Moray where there are (surprise!) 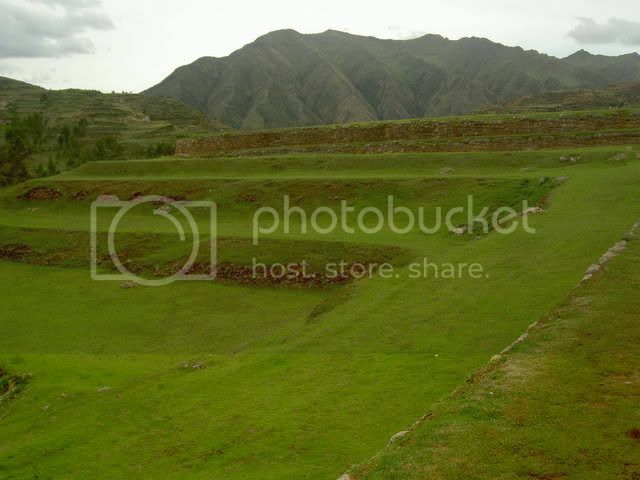 more Incan ruins. After looking around there, I headed back to Cusco, which involved climbing back up the backside of the ridge to get into the Valley of Cusco. Eventually I crossed the last ridge and saw Cusco laid out below me, Sacsayhuaman and the White Christ Statue of to my left, the Plaza de Armas just underneath me. The ride down through the hillside suburbs was like a video game; I was faster than the slow trucks and buses riding their brakes down the hill, and I had to pick the oportune moments to swing past them and get back over to the right. After about 13 switchbacks I got down to the colonial city, where the road turns to cobblestone and I was forced to dismount and walk my way back through town to where I returned the bike. 2. going flat or uphill => in this case, dogs can approach from all sides, but the technique works the same...get over to the side of the road, and dismount. keep the bike between you and the dog. stop and look at it. it will stop running at you at least. If it keeps barking, or wont go away, swoop down to pick up a rock (even if there arent any rocks, pretend: to dog doesnt know the difference, and recognizes the swoop as a signal that a rock is about to get thrown at it). if they dont stop, throw the rock. repeat. both techniques worked and kept this ride rabies free. 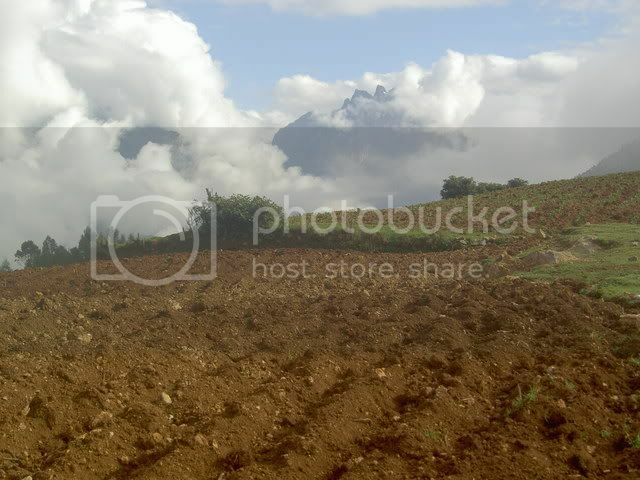 for more pcitures, click the purty pictures link on the left.